A new plastic “skin” can detect how hard it is being pressed and generate an electric signal to deliver sensory input directly to a living brain cell. The work takes another step toward replicating one aspect of touch, the sensory mechanism that enables us to distinguish the pressure difference between a limp handshake and a firm grip. Zhenan Bao, a professor of chemical engineering at Stanford University, has spent a decade trying to develop a material that mimics skin’s ability to flex and heal, while also serving as the sensor net that sends touch, temperature, and pain signals to the brain. Ultimately she wants to create a flexible electronic fabric embedded with sensors that could cover a prosthetic limb and replicate some of skin’s sensory functions. Five years ago, researchers first described how to use plastics and rubbers as pressure sensors by measuring the natural springiness of their molecular structures. They then increased this natural pressure sensitivity by indenting a waffle pattern into the thin plastic, which further compresses the plastic’s molecular springs. Researchers have been developing flexible electronics that can bend without breaking. For the new project, they worked with researchers from PARC, a Xerox company, which has a technology that uses an inkjet printer to deposit flexible circuits onto plastic. 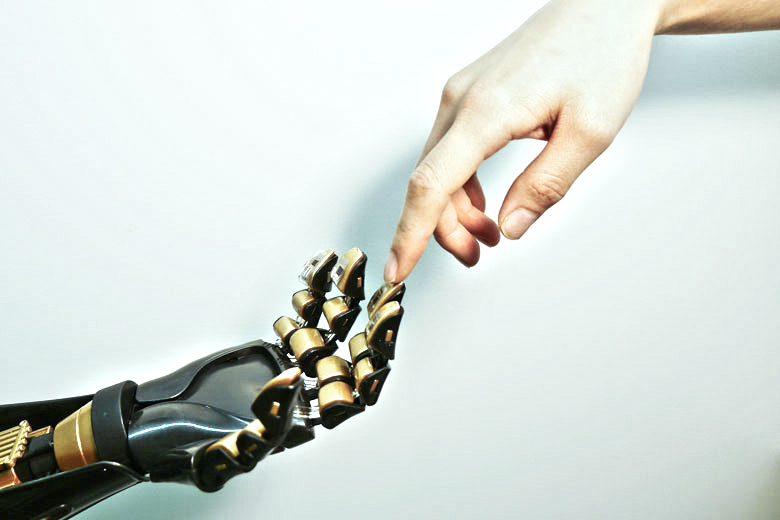 Covering a large surface is important to making artificial skin practical, and the PARC collaboration offered that prospect. Finally the team had to prove that the electronic signal could be recognized by a biological neuron. It did this by adapting a technique that combines genetics and optics, called optogenetics. Researchers bioengineer cells to make them sensitive to specific frequencies of light, then use light pulses to switch cells, or the processes being carried on inside them, on and off. For the new experiment, reported in the journal Science, team members engineered a line of neurons to simulate a portion of the human nervous system. They translated the electronic pressure signals from the artificial skin into light pulses, which activated the neurons, proving that the artificial skin could generate a sensory output compatible with nerve cells. Optogenetics was only used as an experimental proof of concept—other methods of stimulating nerves are likely to be used in real prosthetic devices. The team has already shown that direct stimulation of neurons with electrical pulses is possible. Bao’s team envisions developing different sensors to replicate, for instance, the ability to distinguish corduroy versus silk, or a cold glass of water from a hot cup of coffee—but this will take time. There are six types of biological sensing mechanisms in the human hand, and the experiment reports success in just one of them.